﻿ Press / Media centre - FSK - Fachverband Schaumkunststoffe und Polyurethane e.V. Dear visitors, to access the FSK member area, please enter your data here. 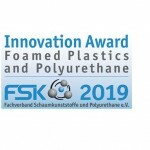 In 2019, the Association of Foamed Plastics and Polyurethanes (FSK) announces the Innovation Award for Foamed Plastics and Polyurethanes. Young talents and specialists, professionals and companies are invited to submit innovative ideas, forward-looking concepts and new developments in the field of foam plastics and polyurethanes. The FSK has set itself the goal of promoting and motivating young people from the industry to submit new ideas, concepts and developments. To this end, the FSK annually awards an innovation prize in the categories “Technology” and “Design”. The prize is awarded alternately to foam plastics and polyurethanes. In 2019, it will be announced specifically for innovations in both material areas – foam plastics and polyurethanes. Individuals and groups from universities and companies throughout Europe can apply until August 16, 2019. Entries from junior staff and professionals or companies will be evaluated and awarded separately in order to ensure a fair and appropriate assessment and award based on knowledge and experience. The evaluation is carried out by a jury of experts selected by the FSK. Criteria are the novelty and innovative strength of the submitted products and solutions, as well as their marketability and competitiveness. 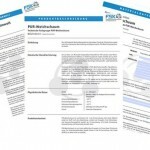 Application documents can be requested from the FSK office or downloaded from its website. The award ceremony will take place in Reutlingen (BW) on 13 November 2019 as part of the International FSK Conference on Polyurethanes. The winners in the field of junior staff can receive additional funding of up to 3000 euros to establish their innovations on the market. Application documents can be found on the FSK website. 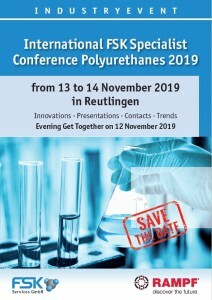 The Association of Foamed Plastics and Polyurethanes (FSK) is organizing the industry event – the International Specialist Conference Polyurethanes – from November 13 to 14, 2019. With innovations, lectures, contacts and trends, especially from the polyurethanes materials sector, the association offers a platform for knowledge exchange and networking, this year in Reutlingen (BW). Innovative lectures by industry experts and the traditional evening event are the main features of this year’s FSK International Specialist Conference. The event will be rounded off by a highly interesting factory tour of RAMPF Holding GmbH & Co. KG in Grafenberg. 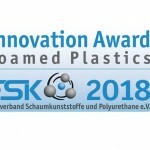 The Specialist Association Foamed Plastics and Polyurethanes (FSK) is once again calling for entries for the Innovation Award Foamed Plastics in 2018. The competition is open to young talents and specialists, professionals and companies – to submit innovative ideas, forward-looking concepts and new developments in the field of foam plastics. Stuttgart, 23 April – The Specialist Association Foamed Plastics and Polyurethanes (FSK) has set itself the goal of promoting young industry professionals and motivating them to submit new ideas, concepts and developments. Each year, the FSK presents an innovation award in the categories “Technology” and “Design and Construction”. The prize is awarded alternately to the Foamed Plastics and Polyurethanes divisions. In 2018, the competition will be specifically for innovations in the field of foamed plastics. Applications are open until 3 September 2018 to individuals and groups from universities and companies across Europe. Submissions from junior professionals and senior professionals or companies will be evaluated and awarded separately in order to ensure a fair and appropriate assessment and according to the level of knowledge and experience. The evaluation is carried out by a jury of experts selected by the FSK. The criteria are the newness and innovative power of the submitted products and solutions, as well as their market and competitive ability. 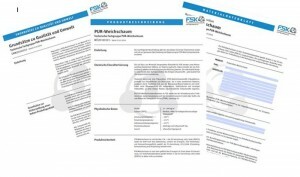 Application documents can be requested from the FSK office or downloaded from its website. 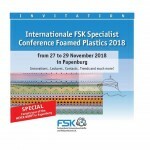 The award ceremony will take place in Papenburg on 28/29 November as part of the 19th International FSK Specialist Conference Foamed Plastics. The winners in the category junior professionals will receive an additional cash prize of up to 3,000 Euros in order to establish their innovations on the market. The Specialist Association Foamed Plastics and Polyurethanes (FSK) presents the results of its work online. New technical data sheets and product descriptions for PUR flexible foam are now available for download on the association’s website. Stuttgart, July 11, 2018 – The Technical Specialist Group PUR Flexible Foam of the Specialist Association Foamed Plastics and Polyurethanes (FSK) is an expert committee whose task is the further development of the PUR flexible foam sector. The results of its work lead, among other things, to the further development of technical documentation. New data sheets and product descriptions are now openly available to all members and interested parties on the FSK website. These documents are also available in an English version. The data sheets typify and specify different PUR foams such as gel, hypersoft, cold or visco-foam for a wide range of applications and uses. The specialist association also provides a data sheet on the bulk density and hardness tolerances of PUR flexible foams, a sample material data sheet and a basic principle document on quality and the environment. “The data sheets provide the processing industry in particular with valuable information on how to handle the various types of PUR flexible foams. This applies to both processing and application,” says Manfred Stahl, Managing Director of Eurofoam Deutschland GmbH Schaumstoffe and spokesman of the Technical FSK Specialist Group PUR Flexible Foam. The technical documentation describes the mechanical and chemical-physical properties of the various foam families. The material data sheet also serves as a sample, making it easier to properly record the labelling of your own products. There are also recommendations for action when dealing with PUR flexible foam. “The principles on quality and the environment enhance the applicable DIN and international standards and guidelines and link these, for example in the VdS guidelines, with the regulations of the insurance industry”, explains Manfred Stahl. 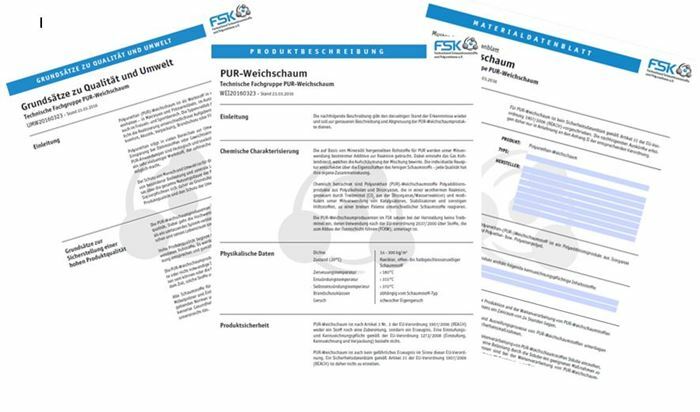 The data sheets and product descriptions for PUR flexible foam in German and English can be found on the FSK website at www.fsk-vsv.de. Innovations, lectures, contacts and trends – the Specialist Association Foamed Plastics and Polyurethanes offers the perfect platform at its annual industry event, the International Foamed Plastics Conference in Papenburg at the end of November. Stuttgart, 14 June 2018 – The Specialist Association Foamed Plastics and Polyurethanes (FSK) will be holding its annual International FSK Specialist Conference Foamed Plastics from 27 to 29 November. The 2018 venue for the FSK Specialist Conference will be the Forum Alte Werft in Papenburg and will offer participants everything they need to know about foamed plastics. 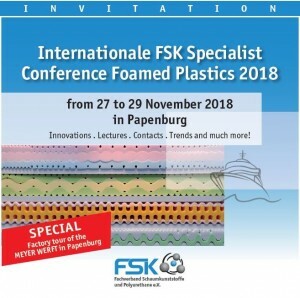 The two-day conference agenda includes lectures from numerous companies and institutions in the field of foamed plastics and of course, the traditional FSK evening event. Among other things, new solutions with technical foams and composites in various fields of application, flame protection in PUR and innovations in lightweight construction will be presented. Further topics will include effective vibration isolation with IMO-certified PUR elastomers and the introduction of technologies for using high-pressure water jets as universal cutting media. 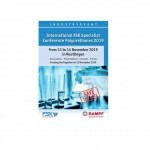 “It is very important that, with this international conference, the specialist association offers the industry a platform where topics in the field of foamed plastics are addressed in a variety of ways and from different perspectives. There should also be enough time for questions and discussions,” said Klaus Junginger, Managing Director of the FSK. To provide the participants with the opportunity for intense discussions and networking, the association itself has organised an interesting supporting programme, which will begin with an evening Get-Together at the Fischhaus Smutje in Papenburg and extend to an evening event at the Alter Güterbahnhof. A special highlight this year will be the tour of the MEYER WERFT shipyard. The presentation of the FSK Innovation Award Foamed Plastics 2018, for which submissions are currently being accepted, will also take place in a festive setting. “With the wide variety of topics, the participants can look forward to extremely interesting and future-oriented impulses from the professional world,” promises Klaus Junginger. Very special and new – this year companies have the opportunity to present their company, special technologies or innovations to the participants of the event as exhibitors in the Forum Alte Werft. Space is limited! If you are interested in exhibiting, please contact the FSK team directly. 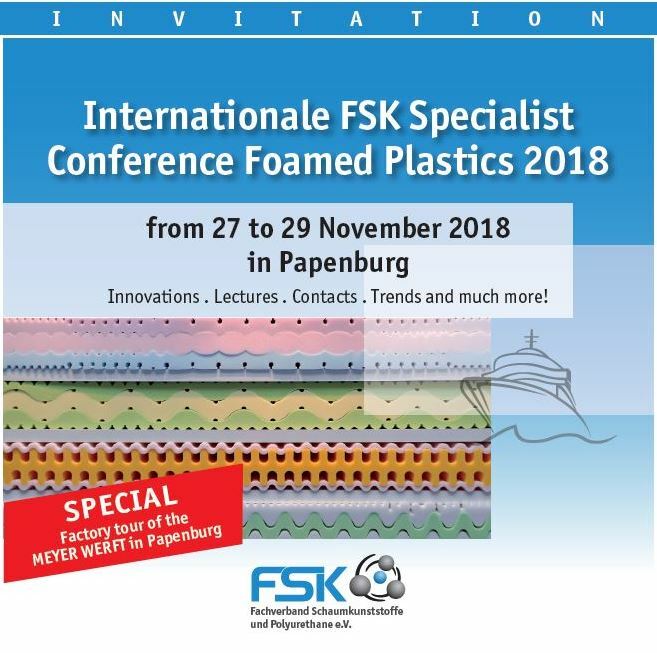 The programme for the International FSK Specialist Conference Foamed Plastics 2018 is now available for download on the website of the specialist association. Registration online, by fax: +49 (0) 711 993 751 11 or by e-mail: fachtagung2018@fsk-vsv.de or by postal mail directly to the FSK.